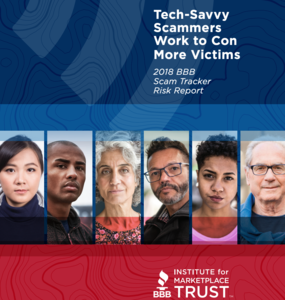 Employment scams were the riskiest scams in 2018, according to the latest report from the Better Business Bureau, Tech-Savvy Scammers Work to Con More Victims: 2018 BBB Scam Tracker Risk Report www.BBB.org/RiskReport . Employment scams had more instances and higher losses than in previous years when it ranked the third riskiest. The report is based on data supplied by consumers to BBB Scam TrackerSM www.BBB.org/ScamTracker and is based on the BBB Risk Index, a unique algorithm that calculates exposure, susceptibility, and monetary loss to offer a more accurate assessment of scam risk. Digging into the Risk Report shows one possible answer: Amazon was in the news a lot in 2018 with its high profile search for a second headquarters. It was also the 6th most impersonated organization mentioned in BBB Scam Tracker reports, after not even making the top 15 in previous years. In 2017, only 24 BBB Scam Tracker reports were employment scams that mentioned Amazon. In 2018, that jumped to 564. Amazon, a BBB Accredited Business, has only one authorized job application site: amazon.jobs. Any other link is a scam. The Internal Revenue Service is the leading impersonated organization, and other government agencies together rank second. Other leading brands that scammers impersonate include Publishers Clearing House, Microsoft, Apple… and Better Business Bureau. "Employment scams are particularly horrible because they prey on people who are already feeling financially strained and may be desperate for work,” said Luke Frey, associate director of communication for BBB Serving Connecticut. “If the scam gets far enough, scammers collect the same information that real employers do – address, birth date, Social Security number, bank account – everything needed for identity theft, and that's where the real trouble begins." The ten riskiest scams of 2018 were: employment, online purchase, fake checks/money orders, home improvement, advance fee loans, romance, tech support, investment, travel/vacation, and government grant.